EGT or Euro Games Technology was founded in 2002 in Bulgaria. Within few years they became one the biggest names on Eastern Euro market and decided to go forth and “conquer” the world. Bulgaria entering the European Union in2007 was exactly what they needed. Since then, EGT slots became available on 4 continents (Europe, Asia, South America and Africa) and in 75 countries. During the past few years, they made an effort also to penetrate the 7th continent: online gaming. Currently, EGT online slots portfolio consists 70 titles, plus variety of popular casino games, such as blackjack, roulette and more. 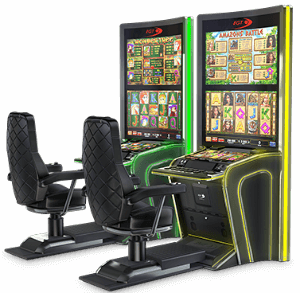 EGT are very different from most “new” slot developers (they are here for over a decade, but that can be considered new compared to classic IGT, Aristocrat and even Microgaming). While others focus on extensive visual effects, animations and arcade-like bonus features (BetSoft for example), EGT are focused on making classic casino video slots. They just try to make them better, which is not an easy task. EGT slots usually based on familiar symbols, cherries, bells, 7s, and classic bonus features, like free spins for example. EGT closely resemble Novomatic slot machines, not only by general design, but even by titles, Supreme Hot vs. Ultra Hot, Rise of Ra vs. Novomatic’s Book of Ra. Both companies even started on central/eastern EU market and now expend worldwide. The easiest way to recognize EGT online slots machine is by their trademark 4-level progressive jackpot. The jackpot can trigger randomly at the end of each spin. The moment it happens – you are guaranteed one of the jackpots. The question is which one. That will be determined by the Jackpot cards mystery bonus, which is a Pick Me bonus where each jackpot is represented by a specific card suit. The jackpots vary from few thousand dollars and up to life changing 6 digit amounts. One of the advantages of playing EGT slots online is that unlike in land based casinos, the RTP of many online slots is revealed, so you can increase your winning odds by sticking to the loosest available slots. EGT games are certified by known testing laboratories such as GLI & SIQ.